While trying to rescue an elite U.S. military team that still remains missing in the mountains of Kunar province, MAJ Reich of Washington Depot, Conn. was one of 16 troops killed when their MH-47 Chinook helicopter was shot down. The soldiers were assigned to the 160th Special Operations Aviation Regiment (Airborne) from Georgia. FORT BRAGG, N.C. (USASOC News Service, July 1, 2005)  An MH-47D Chinook helicopter crashed June 28, 2005 near Asadabad, Afghanistan, killing three special operations officers and five special operations Soldiers from the 160th Special Operations Aviation Regiment (Airborne) while conducting combat operations in support of Operation Red Wing. Maj. Stephen C. Reich, 34, of Washington Depot, Conn., Chief Warrant Officer Chris J. Scherkenbach, 40, of Jacksonville, Fla., Warrant Officer Corey J. Goodnature ,35, of Clarks Grove, Minn., Sgt. 1st Class Marcus V. Muralles, 33, of Shelbyville, Ind., Sgt. 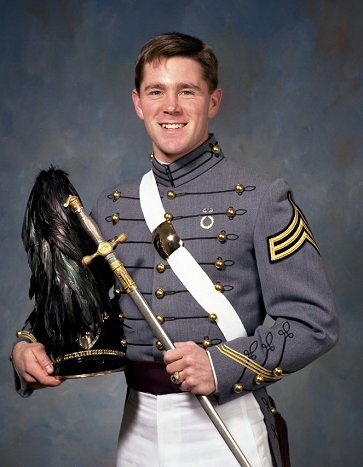 1st Class Michael L. Russell, 31, of Stafford, Va., Staff Sgt. Shamus O. Goare, 29, of Ohio and Sgt. Kip A. Jacoby, 21, of Pompano Beach, Fla., were killed when the helicopter was struck by an enemy rocket propelled grenade in the countrys Kunar province. All were assigned to the 3rd Battalion, 160th Special Operations Aviation Regiment (Airborne) based at Hunter Army Airfield, Ga.
Sgt. 1st Class James W. Ponder, III, 36, of Franklin, Tenn., was killed as a result of the crash. He was assigned to Headquarters and Headquarters Company, 160th SOAR(A) based at Fort Campbell, Ky. The officers and Soldiers were deployed to Afghanistan in support of Operation Enduring Freedom. Afghan National Army and Coalition forces remain actively engaged in Operation Red Wing, an effort to defeat terrorists operating in Kunar province. The operation is part of a larger spring campaign by U.S. and Afghan forces to kill and capture fighters from hideouts in the east and south of Afghanistan. The MH-47 conducts overt and covert infiltrations, exfiltrations, air assault, resupply, and sling operations over a wide range of environmental conditions. With the use of special mission equipment and night vision devices, the air crew can operate in hostile mission environments over all types of terrain at low altitudes, and during periods of low visibility. 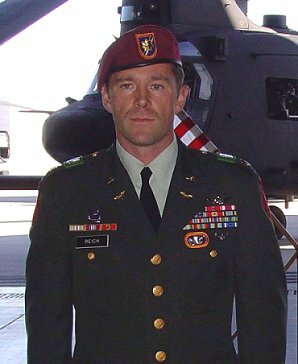 Maj. Stephen C. Reich died June 28, 2005, in eastern Afghanistan when his MH-47D Helicopter was shot down by enemy fire during combat operations. He was born May 22, 1971 in Ohio, and was raised in Washington, Conn. He graduated from the United States Military Academy with a Bachelor of Science degree and received his commission in 1993. In 1994, he attended the Aviation Officer Basic Course and Initial Entry Rotary Wing training. In 1995 he was assigned to the University of Kentucky ROTC program, and played professional baseball in the Baltimore Orioles organization. After receiving a UH-60 Blackhawk transition in 1996, he was ordered to Germany where he served as Platoon Leader in Company A, 5th Battalion, 158th Aviation Regiment. During his subsequent tour with the 12th Aviation Brigade he served in Operation ALLIED FORCE deploying to Hungary, Bosnia, Albania, and Kosovo. Returning from Germany in 2000, Reich attended the Infantry Captains Career Course at Ft. Benning, Ga. followed by the Combined Arms Services Staff School at Ft. Leavenworth, Kan. Upon arrival to the 160th Special Operations Aviation Regiment, he deployed with 2nd Battalion to Operation ENDURING FREEDOM as Battle Captain in support of Task Force Dagger. In December 2001, he served as Operations Officer for 2nd Battalions detachment of MH-47D aircraft in Afghanistan. He commanded Headquarters and Headquarters Company, 2nd Battalion from February 2002 through May 2003. Company, 160th SOAR(A). Reichs military schools include: Survival Evasion Resistance and Escape C Course, the Airborne School, and Air Assault Course. His awards and decorations include the Bronze Star, the Meritorious Service Medal, the Army Commendation Medal, the Army Achievement Medal, the Joint Meritorious Unit Award, and the Senior Aviator, Airborne, and Air Assault Badges. He was posthumously awarded the Purple Heart, the Meritorious Service Medal, the Bronze Star Medal and an Air Medal with Valor device and the Combat Action Badge. Reich is survived by his wife, Jill, of Panama City, Fla.